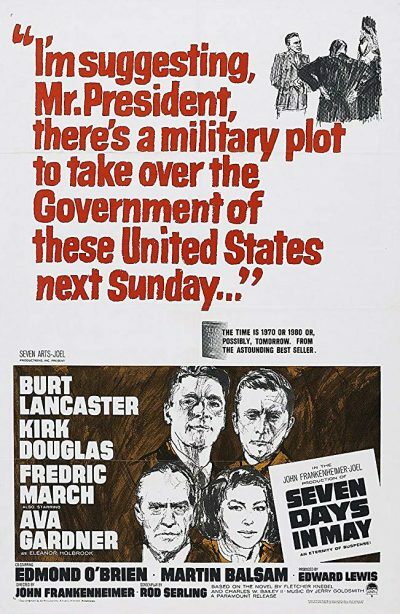 Seven Days in May is an American political thriller motion picture directed by John Frankenheimer, starring Burt Lancaster, Kirk Douglas, Fredric March, and Ava Gardner, and released in February 1964 with a screenplay by Rod Serling based on the novel of the same name by Fletcher Knebel and Charles W. Bailey II, which was published in 1962. The story is said to have been influenced by the right-wing anti-Communist political activities of General Edwin A. Walker after he resigned from the military. An additional inspiration was provided by the 1961 interview by Knebel, who was also a political journalist and columnist, conducted with the newly-appointed Air Force Chief of Staff, Curtis LeMay, an advocate of preventive first-strike nuclear option. President John F. Kennedy had read the novel and believed the scenario as described could actually occur in the United States. According to Frankenheimer in his director’s commentary, production of the film received encouragement and assistance from Kennedy through White House Press Secretary Pierre Salinger, who conveyed to Frankenheimer Kennedy’s wish that the film be produced and that, although the Pentagon did not want the film made, the President would conveniently arrange to visit Hyannis Port for a weekend when the film needed to shoot outside the White House. 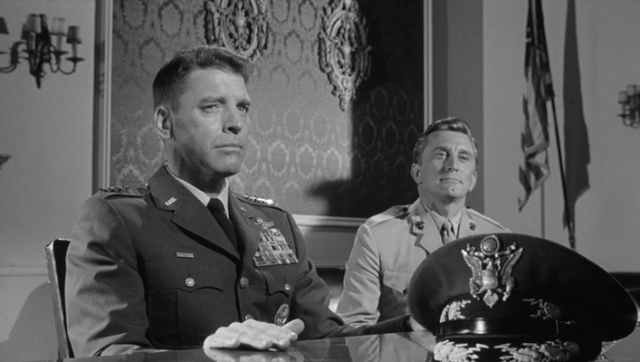 Kirk Douglas and director John Frankenheimer were the moving forces behind the filming of Seven Days in May; the film was produced through Douglas’s Joel Productions. Douglas agreed to star in it, but he also wanted his frequent co-star Burt Lancaster to star in the film as well. This almost caused Frankenheimer to back out, since he and Lancaster had butted heads on The Birdman of Alcatraz several years before. Only Douglas’s assurances that Lancaster would behave kept the director on the project. Ironically, Lancaster and Frankenheimer became close friends during the filming, while Douglas and the director had a falling out. Some of the other actors had problems with Frankenheimer. Ava Gardner thought he favored the other actors over her and Martin Balsam objected to his habit of shooting off pistols behind him during important scenes. John Houseman, then a well-known producer, made his American feature acting debut in a small role as a vice-admiral (he would not appear onscreen again until his Oscar-winning role in 1973’s The Paper Chase). Interiors for Seven Days in May were shot at the Paramount studios in Hollywood, and on location in Paris, France, Washington, D.C., San Diego, Arizona and in California’s Imperial Valley. In an early example of guerrilla filmmaking, Frankenheimer photographed Martin Balsam being ferried out to the supercarrier USS Kitty Hawk, berthed at Naval Air Station North Island in San Diego, without prior Defense Department permission. 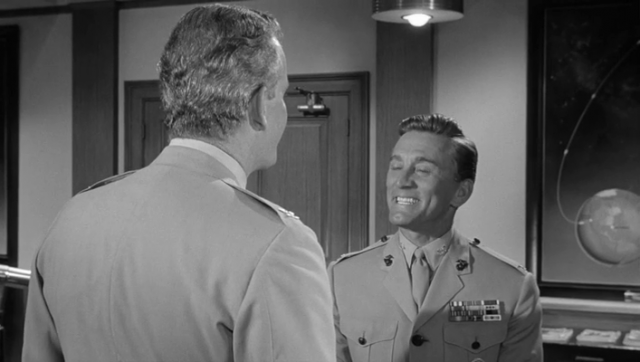 He also wanted a shot of Kirk Douglas entering the Pentagon, but could not get permission because of security considerations, so he rigged a movie camera in a parked station wagon to photograph Douglas walking up to the Pentagon. Douglas actually received salutes from military personnel inasmuch as he was wearing the uniform of a U.S. Marine Corps colonel. Getting permission near the White House was easier. Frankenheimer said that Pierre Salinger conveyed to him President Kennedy’s wish that the film be made, “these were the days of General Walker” and, though the Pentagon did not want the film made, the president would conveniently arrange to visit Hyannis Port for a weekend when the film needed to shoot outside the White House. Kirk Douglas recalled President Kennedy approving of the making of the film. Some efforts were made in the film to have the movie appear to take place in the near future, for instance the use of the then-futuristic technology of video teleconferencing. 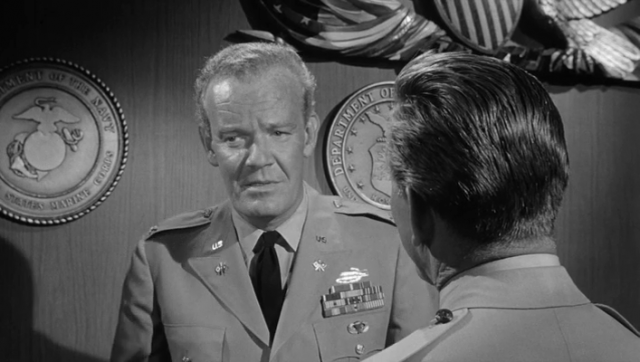 The film also featured the then recently issued M16 rifle.